Marc Joliot, Ph.D. is a senior researcher in multimodal biomedical imaging at the French Atomic Energy Commission (CEA). After receiving his Ph.D. degrees in NMR signal processing in 1991 at the Paris 11 University, he founded with Bernard Mazoyer (Dir.) and Nathalie Tzourio-Mazoyer the neuroimaging group (GIN) at the SHFJ at Orsay, which realized the first French positron emission (PET) activation study. From 1991 to 1992 held a postdoctoral position and perform research’s on 40hz oscillations with magneto-encephalography at the Department of Physiology and Biophysics, New York University Medical Center, USA. From 1993 to 1999 he held several researcher position at SHFJ working on magnetoencephalography, PET and the functional magnetic resonance imaging (fMRI) technics. In 2000 he became senior scientist and joined the joint research unit CINAPS (Caen university, CNRS, CEA) at Caen, France where he focused on the electromagnetic/hemodynamic multimodal imaging; He also held the position of technical director of the CYCERON imaging facility (PET, EEG, 7T and 3T MRI facility). From 2007 to 2010 he led a research theme on neurofunctional imaging of the conscious state team. 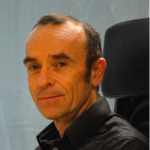 In 2011 he moved to Bordeaux (Join research unit of Bordeaux University/CNRS/CEA, France) to pursue researches on resting state intrinsic connectivity. The primary focus is on the intrinsic connectivity observed in functional MRI in the resting state. The developed approach is based on multiscale modeling of the organization of this activity. This search has for object the study of the variability of this organization through the population and its relation with the organization highlighted by the cognitive imaging studies. It also has for object the influence of the demographic parameters and the activity of the subjects during the rest. The second focus is on the development of new methodology in bioimaging data acquistion, analysis and management: AAL atlas (Citation index of 4800), AICHA functional homotopic atlas, a Multi-scale Independent Component Clustering Algorithm (MICCA), the BIOMIST database and the Resting state questionnaire (RESQ). The third focus is on electromagnetic / hemodynamic and metabolic multimodal imaging.